Don’t be weighed down with debt forever. 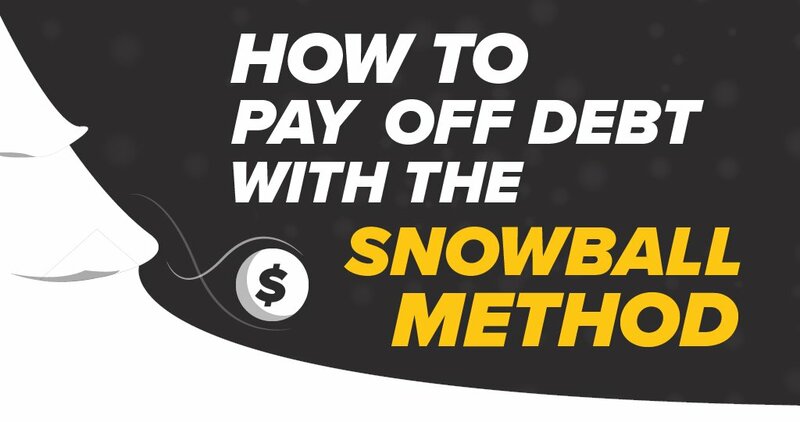 Here is how, by simply using the snowball method to pay off debt. Add the snowball method to your debt payoff planner and you will be able to pay off your debt faster than you ever thought possible! The concept of a debt snowball is to pay off your smallest debt first and then once the balance is paid in full, roll that “extra” money into the current payment of your next smallest debt. Again, once that debt is paid in full, take the sum payment and roll it into your next smallest debt. Pretty soon, you’ll see your outstanding debts get lower and lower, faster and faster. List all your debts – Smallest to largest. Pay as much as possible into the smallest debt. Rollover the payment from the smallest to the next. Maybe you have outstanding balances on three credit cards with minimum payments of $25, $50, and $100. After your lowest credit card balance is paid off, take that $25 payment and add it onto your next lowest monthly payment of $50 for a new $75 monthly payment. When that second card is paid in full, take the $75 you had been paying and add it to your $100 minimum monthly payment on your last card for a new payment of $175. You’re now much closer to being debt free! Heard about the Avalanche Method? Checkout this article for a comparison of the Avalanche Method and Snowball Method to get out of debt. If you don’t have too many loans or outstanding bills it may be easy for you to keep track of your snowball debt payments on your own. However, if you have debt from a variety of sources or you just want a little extra clarity and help, try one of these four helpful debt snowball apps or tools. Vertex42 gives you a free basic debt snowball spreadsheet to download or you can pay to download the extended or pro versions. Unbury.me is a simple and straightforward debt calculator to help you decide if the debt snowball method or the debt avalanche method (paying your highest interest rate first) is best for your personal financial situation. Debt Manager is the #1 ranked finance app in the US and UK for a reason. Debt Payoff Assistant is another great app that allows you to track an unlimited number of debts and design multiple payoff strategies. The built-in calculators are also very helpful. With the right tools, paying off debt and getting into better financial shape is easier than ever. When it comes to debt-payoff tips, we’re not talking about saving $10 a week by clipping grocery coupons. That’s simply not going to be enough to pay off significant debt any faster due to the constantly calculated interest rates that are working against you. In order to actually make any headway on your debt, reducing or eliminating your interest payments is a surefire way to success. 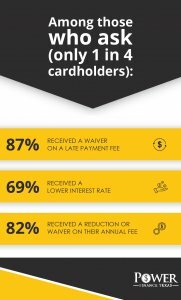 Creditcards.com has recently surveyed American cardholders to find out if they have been able to negotiate better credit card terms just by asking their credit card companies. The results are positive! If you are polite and talk to a supervisor when necessary, chances are you’ll catch a break. If the credit card company is unwilling to negotiate, it may be worth canceling your card with them. With credit card interest rates often being over 20%, it doesn’t take much for you to be completely underwater in interest fees alone. Many credit card companies offer an introductory period of zero interest when you transfer your debt to their card. Doing so can allow you to pay down your debt much quicker. Just be sure to watch for balance transfer fees, the rate of interest after the introductory period, and the date that your introductory interest-free period ends. You have two credit cards totaling $6,000 due. One card has an interest rate of 22% and the other has an interest rate of 17%. Your total monthly minimum due is $180.00. If you transfer those two debts to a new, zero-interest for 12 months card and a 15% interest rate thereafter, even with a balance transfer fee of 3%, you will save $2,326.89 in interest. Calculate your own credit card balance transfer and see how much money you can save. If you have found yourself in an Adjustable Rate Mortage (ARM) or Federal Housing Administration (FHA) loan or simply one with an interest rate that is higher than the current rate and your home has risen in value, it’s definitely time for you to look into refinancing. Doing so can save you a ton of cash, which you can then put toward your outstanding debt. As a simplified example, let’s say your mortgage is for $200,000 at a 4.644% interest rate for 30 years. 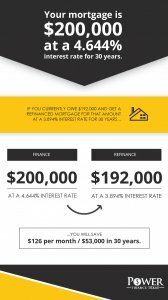 If you currently owe $192,000 and get a refinanced mortgage for that amount at a 3.894% interest rate for 30 years, then you can save $126 per month. That may not sound worth the effort but over the course of the loan you will end up saving over $53,000 in interest payments…and that’s worth it! There are some fees associated with refinancing so it is wise to balance the costs with your long-term savings. Also, be wary of cash-out refinances unless you have a solid plan in place for how you’re going to pay back all the cash down the road. Find out how much you could save by refinancing your mortgage. There may come a point when you have to take a serious look at the state of your debt-to-income ratio and determine if it’s time to free yourself from the heavy burden that debt can carry. If you’re at that point, create your own debt payoff planner or seek professional financial planning to get you on the right path to financial freedom.